When delectable milk chocolate or intense dark chocolate is poured over nutritional, delicious nuts, you have a snack that is so tasty you might tend to forget just how beneficial it is to your health. Milk chocolate is so creamy and soothing that it could easily be included near the top of a list of comfort food. Not only does dark chocolate increase the health benefits of whatever it accompanies, it also increases its flavor and elegance. A chocolate coating on crunchy crisp almonds, soft-textured, sweet, buttery cashews, mellow, nutty pecans, crunchy peanuts and exotic macadamia nuts creates a uniquely textured, sweet, nutty flavored snack that can easily become your favorite, slightly indulgent snack. Due to the popularity and deliciousness of chocolate covered nuts, you will want to buy chocolate covered nuts wholesale to place on your party table or to have chocolate nuts on hand for whenever you or your family want a healthy, sweet treat. When eaten in moderation, both milk chocolate and dark chocolate have numerous health benefits. Fiber is an important part of a healthy diet. Many people fail to get the recommended amount of fiber in their daily diet. Adding chocolate, especially in the form of chocolate nuts, to your diet is a tasty way to increase your fiber intake. Chocolate is a good source of iron, magnesium, copper, manganese, potassium, phosphorous, zinc and selenium. It is also an excellent source of antioxidants. Chocolate contains bioactive compounds that work to support heart health and reduce insulin resistance. With all of the attention being given to age-related cognitive decline, you are sure to be interested in finding ways to prevent it. Research shows that the consumption of cocoa can improve brain function, support brain health and even improve cognitive function in elderly people who demonstrate signs of cognitive decline. Chocolate can help reduce inflammation. Eating chocolate nuts can be beneficial to your appearance. The flavanols from cocoa improve blood flow to the skin and help protect against sun damage. This can help you retain healthy, youthful looking skin. 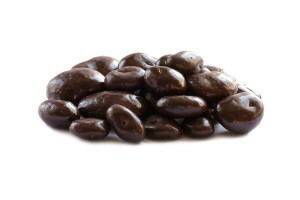 Some studies have shown that, due to the antioxidants found in chocolate, eating chocolate can boost the immune system. Adding chocolate covered nuts to your diet can also improve the body’s natural detoxification process. The key to enjoying the many health benefits of chocolate is to eat it in moderation. You can increase the benefits you gain from enjoying chocolate if you choose healthy snacks such as chocolate covered nuts. You’ll be getting multiple nutritional benefits from this healthy combination. Dark chocolate makes contributions, beyond those that milk chocolate offers, to your overall health ad well-being. Dark chocolate has a hint of bitterness to it which is caused by the high content of cacao. Dark chocolate has less sugar and additives than milk chocolate. Making dark chocolate nuts a regular part of your diet is a delicious and healthy way to acquire multiple health benefits while enjoying a fantastic snack. Dark chocolate protects teeth, supports brain health, heart health and skin health. It can help lower blood pressure. Dark chocolate can improve your mood and reduce anxiety. Dark chocolate is revered for its ability to reduce cravings and therefore is a good snack option for anyone on a weight loss or weight maintenance plan. Studies indicate that the antioxidants in dark chocolate can help prevent cancer. Is Dark Chocolate Good for Diabetics? Research shows that dark chocolate, when eaten in moderation, can be a beneficial part of a diabetic diet. Dark chocolate has a low sugar content and does not cause a spike in blood sugar like many alternative snack options will do. It’s important to note that, not only is dark chocolate beneficial to people with diabetes, it is also beneficial to people that fall into the category of pre-diabetic. Dark chocolate can support glucose control. Increasing one’s sensitivity to insulin can delay the onset of diabetes. Dark chocolate can help reduce the risk of cardiovascular disease in diabetics. It can also help with weight management which is related to the overall health of diabetics. Milk chocolate covered nuts can satisfy a variety of snack cravings. 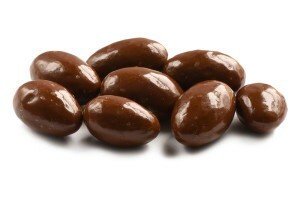 Chocolate covered nuts offer sweetness and crunchiness. By keeping an assortment of chocolate covered nuts on hand, you’ll always have a convenient, delicious grab-and-go snack, the perfect pick-me-up snack and the ideal treat to enjoy while leisurely watching TV or enjoying a good book. Almonds, cashews, pecans, peanuts and macadamia nuts are delicious in their unadorned state. However, coated nuts are a snack that has been elevated to a new, more flavorful level of goodness. Milk chocolate covered nuts have a mood-soothing quality about them. Although they are mild in flavor, they offer a satisfying crunch and the ideal amount of sweetness to make them a highly popular, nutritional snack. Dark chocolate covered nuts are a fantastic alternative to boring snacks that offer little or no nutritional value and often fail to satisfy your hunger or your desire for something tasty. You already know the positive impact that nuts have on your health. Most likely, you add them to trail mix or munch on them as a solitary snack when you need something fulfilling and energizing. Adding dark chocolate covered nuts to your list of snack options will provide you with all the benefits of the nuts and the additional benefits from the dark chocolate. Sweet, buttery cashews are transformed into a luxurious treat when covered in dark chocolate. The timeless peanut becomes a more sophisticated treat when it is hidden underneath a coating of dark chocolate. The nutty flavor of pecans pairs perfectly with the intensity of the dark chocolate. Almonds are one of the most popular nuts. While they’re a great treat in raw or roasted form, they’re an even more impressive and delicious treat when they’re coated with intensely flavorful dark chocolate. Dark chocolate nuts can take snack time up a level on the flavor and sophistication scale. Impress and delight the guests at your next party by providing an assortment of this tantalizing treat on the party table.